Rumors suggest the BMW X3 M will have around 450 horsepower under the hood. We recently caught a , and now our spies have snapped some photos of its smaller sibling. While the X3 M40i is one of the most exciting BMWs currently available, what we’re really waiting for is the proper full-fat X3 M with more power and mechanical upgrades. To whet our appetite, the prototype X3 M shown in these latest spy shots is wearing very little camouflage, giving us our best look yet at the souped-up SUV both inside and out. Aero-enhancing styling tweaks have been concealed well underneath the camouflage, but it can’t hide those large front air intakes. At the back, the X3 test mule sports a quad exhaust system, which is of course a BMW M Division staple, and a larger rear spoiler than the X3 M40i providing extra downforce. We also get a first look inside the high-performance SUV. While a lot of the cabin is covered up to fool you into thinking this is a standard X3, the M shifter and red M1/M2 buttons borrowed from the M5 are a bit of a giveaway. 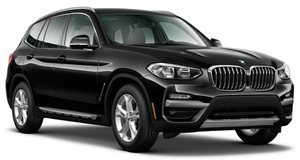 As for mechanical upgrades, expect the X3 M to have a lower ride height, tuned suspension, and bigger brakes to handle the extra grunt under the hood. Power for the X3 M will likely be provided by a tuned version of BMW’s new S58 that will also most likely power the next-generation M3 and M4. In the X3 M, the engine is expected to produce around 450 horsepower and feature two turbochargers, which should give the SUV a serious performance boost. The 355-hp M40i version can sprint to 62 mph in 4.6 seconds, so we wouldn’t be surprised if the X3 M is able to hit the same speed in under four seconds. It's going to be a proper performance SUV that should be well worth the wait. A full reveal is expected before the end of the year.